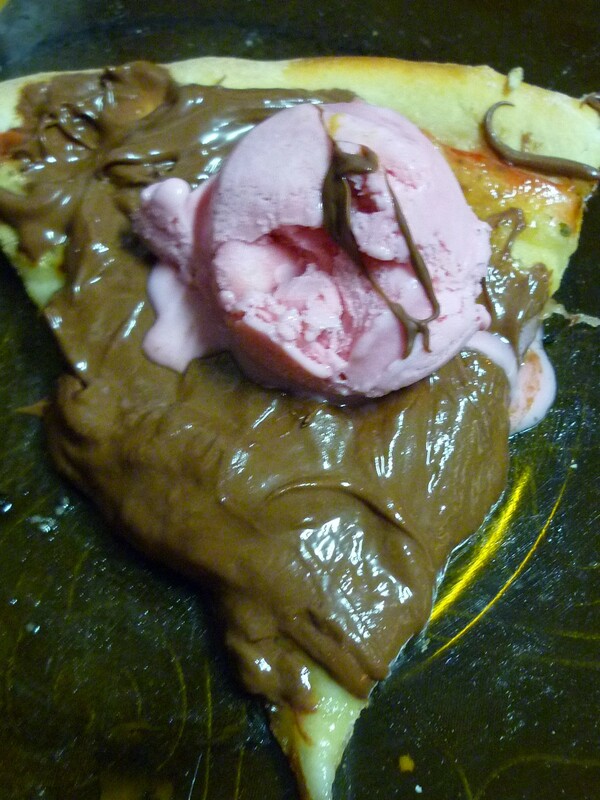 Ice Cream pizza was introduced to us at a Rodizio, which is a waiter service all you can eat food extravaganza. Usually associated with a meat feast where servers arrive at your table with hunks of almost every type of meat you can imagine, including one of our personal favourite chicken hearts. Rodizios actually come in many forms and have a pizza variety. You are armed with an appetite and coaster that has a green and red side that can be turned over to signal whether you are up for more food or not. Pizzas also come in seemingly endless variations, but we were not prepared for the dessert versions of banana and marshmellow or ice-cream ann nutella. Incredible! Brazil is all about exuberance and when we came along this cheeky number we coulddn´t help but include it, as people in Corumba absolutely love it! How: Sieve the flour into the bowl before stirring in the salt and yeast. Add the oil and then slowly add the warm water, while mixing well until all of the flour is well incorporated and non remains in the bowl. Remove from the bowl onto a lightly floured flat surface and with the “heel” of your hand kneed well for 5- 7 minutes until the dough is stretchy and elastic. Place back in the bowl and cover with a towel or plastic wrap and leave for 1 hour 45 minutes in a warm place. The dough should now have lots of holes in and have become very loose. Lightly flour a surface and pull out the dough. Push the dough in the centre to remove some of the air for around half a minute, before leaving it to one side again for 50 minutes. In a food processor purée the chopped tomatoes before adding to a saucepan. Add the sugar and on a medium heat reduce until only 2/3 remain and a spreadable tomato sauce is left. Preheat the oven to 200C. Now take the dough and half it before rolling each out to 1.5cm in thickness circles. Spread over the tomato sauce and then cover in grated cheese. Place on a central shelf in the oven and cook for 215 minutes until the cheese has melted and just begins to turn brown. Remove from the oven, leave to cool for 3 minutes before spreading over the chocolate spread. Leave for a further 2 minutes while you make 2 good sized scoops of ice-cream. Place the balls of ice-cream on the top and serve immediately.